Anyone else all about them tasty, chewy, oh-so-delectable noodles? We just can’t get enough, and this fast and easy noodle paradise dish is sure to please. 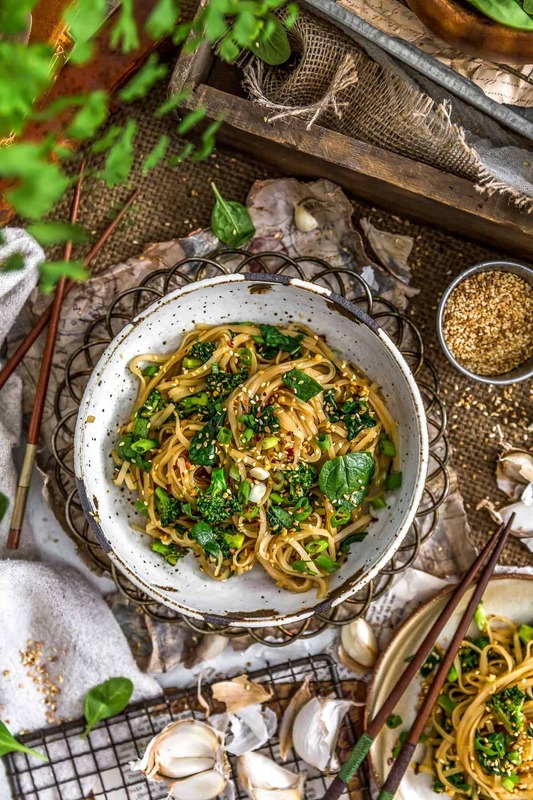 Sweet, savory, and bursting with flavor, our Oil Free Garlic Sticky Noodles can be made in a flash and comes together in less than 20 minutes. Total win! 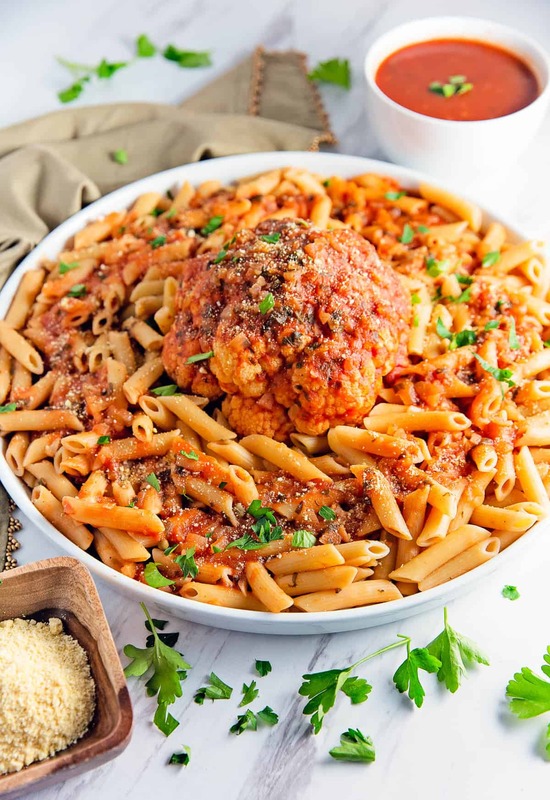 This week’s Whip It Up Wednesday recipe is perfect for weeknights when you need something fast, comforting, and delicious to feed a hungry family. Whole Food Plant Based, vegan, plant based, oil free, refined sugar free, gluten free, no highly processed ingredients. 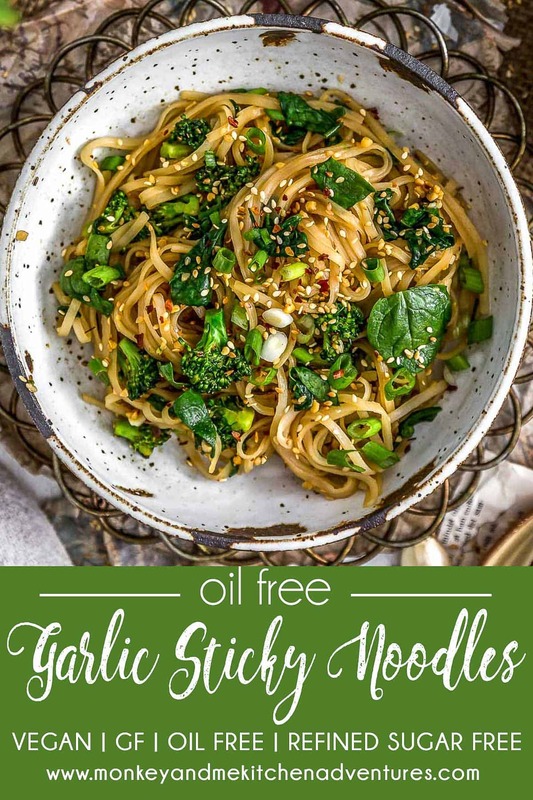 Oodles of noodles is just my thing, and this week’s Whip It Up Wednesday is our delicious Oil Free Garlic Sticky Noodles that are finger lickin’ good! 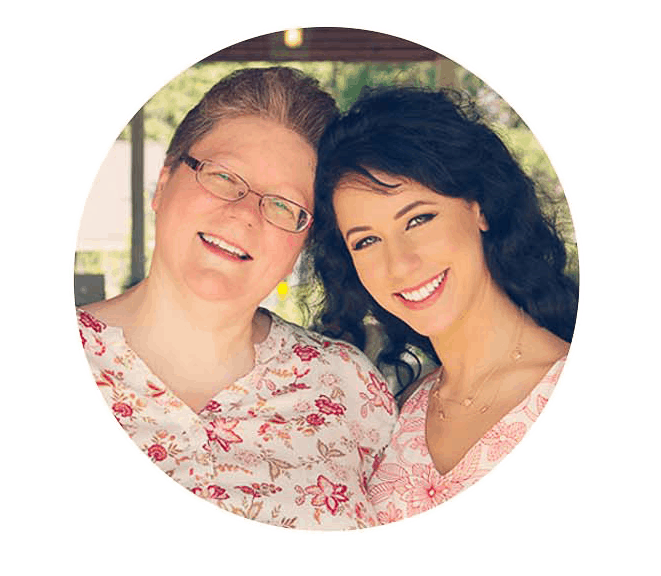 Mom and I are always experimenting with recipes trying to create quick and delicious recipes, and after making this one we were doing our happy dance. As you already know, every Wednesday, we feature a quick and easy recipe that can be “whipped up” in 20 minutes or less. This recipe can be made in about 20 minutes which really helps speed things up in kitchen. If you are a knife wielding wizard, then this one will come together quickly. 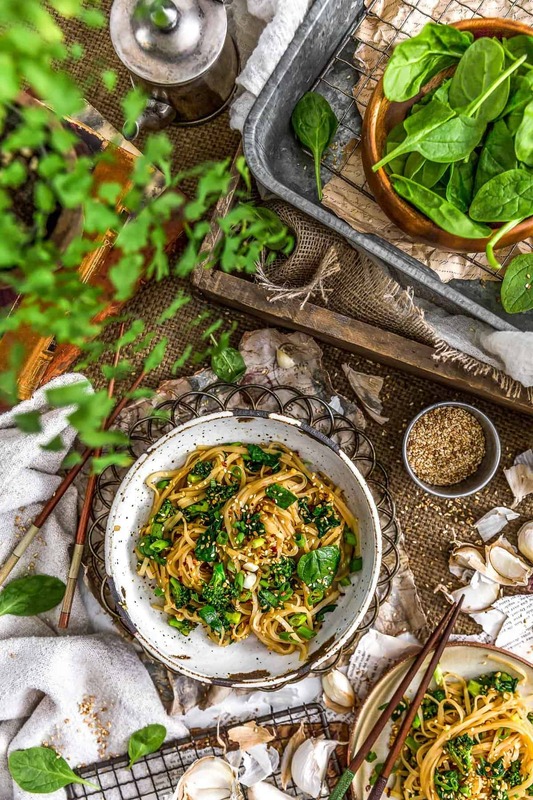 When I say, “sticky,” you say, “noodles.” “STICKY” – “NOODLES” – “STICKY” – “NOODLES” – And with a name like Garlic Sticky Noodles, you just know it’s going to be good! 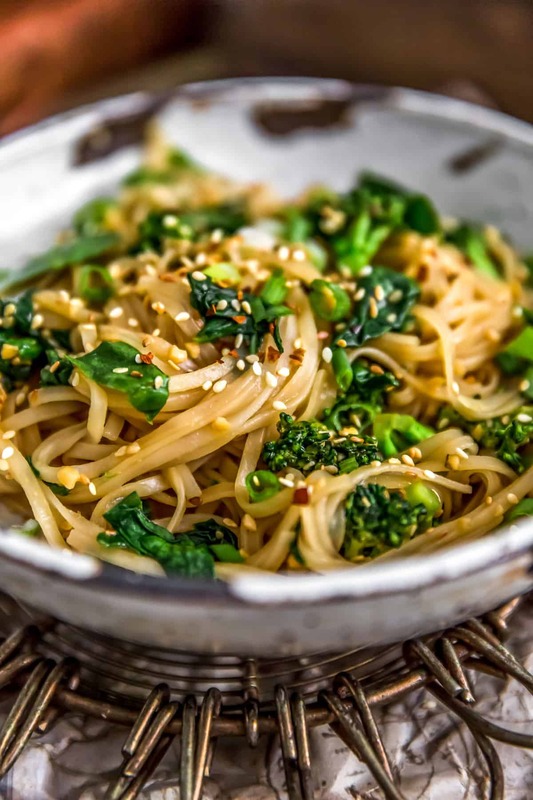 Plus, this tasty Asian sauce perfectly coats rice noodles creating this delightfully sticky dish of yumminess. 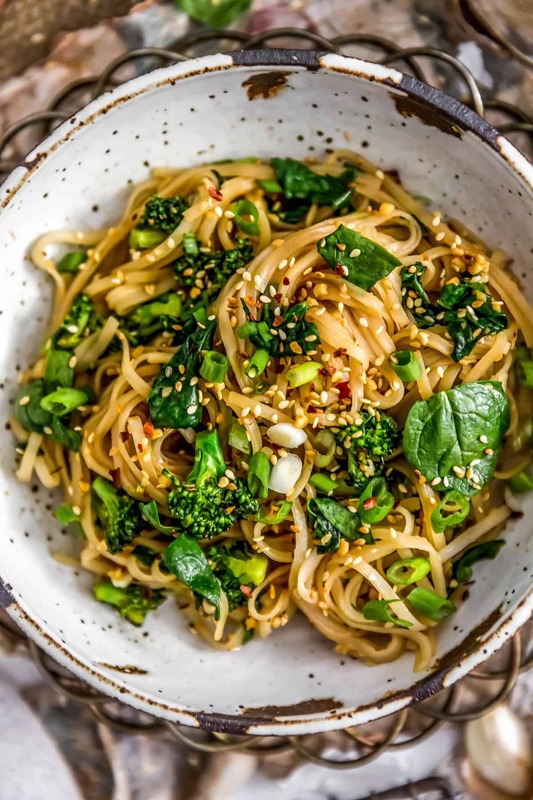 Add some tiny broccoli florets, sliced green onions, and chopped baby spinach, and you’ve got yourself a deliciously healthy, fast family meal. We weren’t kidding when we said these tasty noodles are stick-key. Just be prepared to know that the noodles soak up the sauce in a flash and come together quickly to create a delightful, sticky, noodley goodness. However, we created a trick that helps reduce the stickiness by making a “tahini slurry,” see the recipe for the full details. You may find yourself wanting to eat the whole dish like I did. Give it a try! We would love to know if you love it as much as we do! Anyone else all about them tasty, chewy, oh-so-delectable noodles? 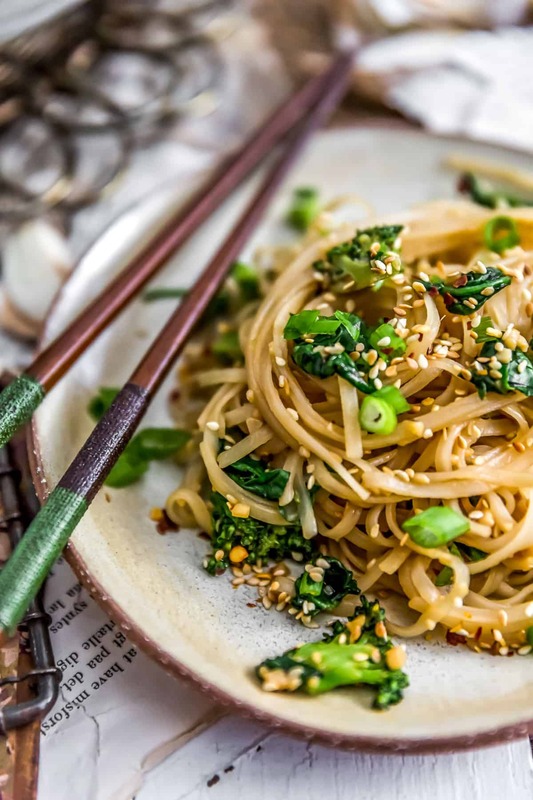 We just can't get enough, and this fast and easy noodle paradise dish is sure to please. 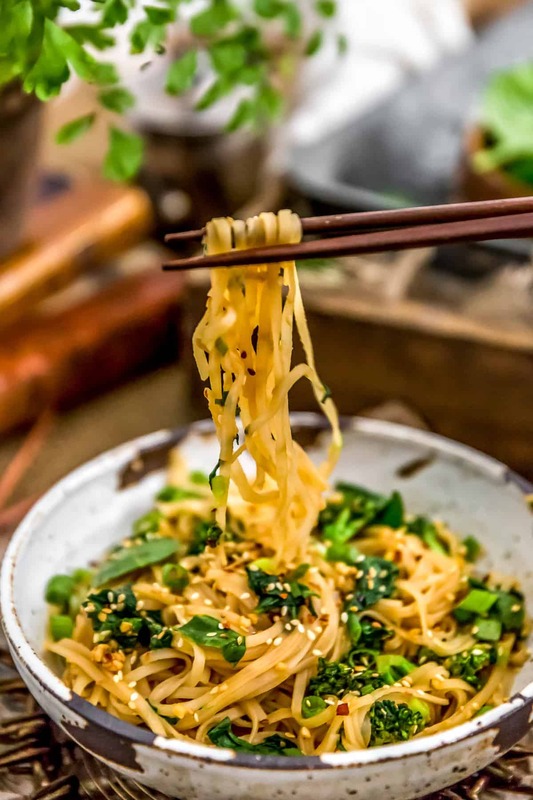 Sweet, savory, and bursting with flavor, our Oil Free Garlic Sticky Noodles can be made in a flash and comes together in less than 20 minutes. Total win! 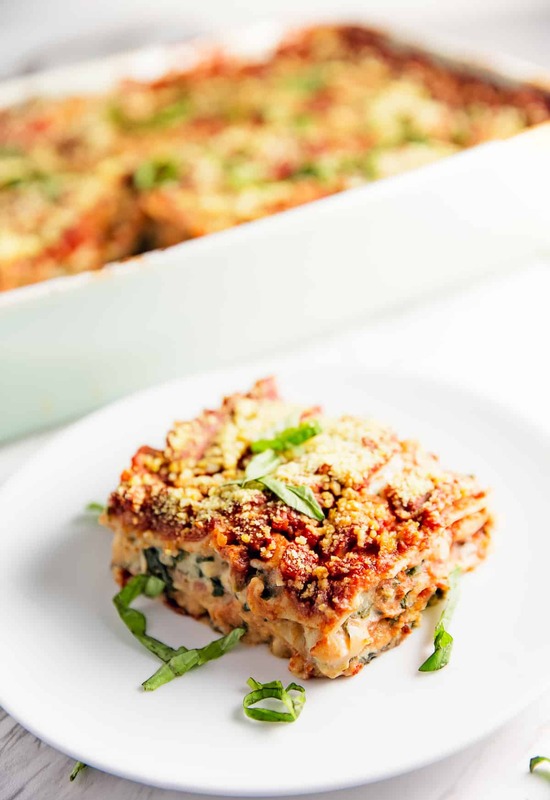 This week’s Whip It Up Wednesday recipe is perfect for weeknights when you need something fast, comforting, and delicious to feed a hungry family. Whole Food Plant Based, vegan, plant based, oil free, refined sugar free, gluten free, no highly processed ingredients. Start boiling the water for the noodles. Do not add the noodles yet. Combine all of the following: tamari, miso, maple syrup, garlic, molasses, red pepper flake, and toasted sesame seeds into a small bowl and whisk well, then set aside. Prepare all the veggies as this recipe comes together fast, set aside. In a large ceramic/enamel lined Dutch oven/pot or similarly large stockpot, add the broccoli florets and ¼ cup water. Cover and steam over medium-high heat for approx. 1-2 minutes or just until all the water has evaporated. Now add the noodles to the separate pot of boiling water and cook according to package directions. Then add the sauce mixture above in Step 2 to the pot with the steamed broccoli florets, cook for a few minutes to caramelize with medium heat. (Note; you add the sauce to the broccoli pot at the same time you add the noodles to the boiling water as they come together fast). As soon as the noodles are done (typically in 4-5 mins), move your pasta pot near the other pot and transport noodles directly from the pasta pot to the broccoli sauce pot. Do not drain them, simply pick up the noodles with a large tongs/pasta utensil and add them to the sauce mixture. As soon as you have moved them over, place the tahini slurry on top of the noodles and the noodles into the sauce to coat well, then add the chopped spinach and chopped green onions, and gently stir until everything is coated with the sauce. The noodles will be sticky. The tahini slurry helps reduce the stickiness. Serve immediately and top with your favorite toppers, ex. chopped green onions, toasted sesame seeds, red pepper flake, etc. *Tahini Slurry/Sticky Noodles: This recipe is called “sticky noodles” because the cooked noodles are very sticky. Easy TIPS for success. Do not drain the water from the noodles. Using a pasta utensil or tongs, move the pans close together and simply move the noodles from the hot noodle water directly into the broccoli sauce pot. Then immediately place the tahini slurry on top of the noodles. The tahini slurry helps keep the noodles from becoming too sticky. 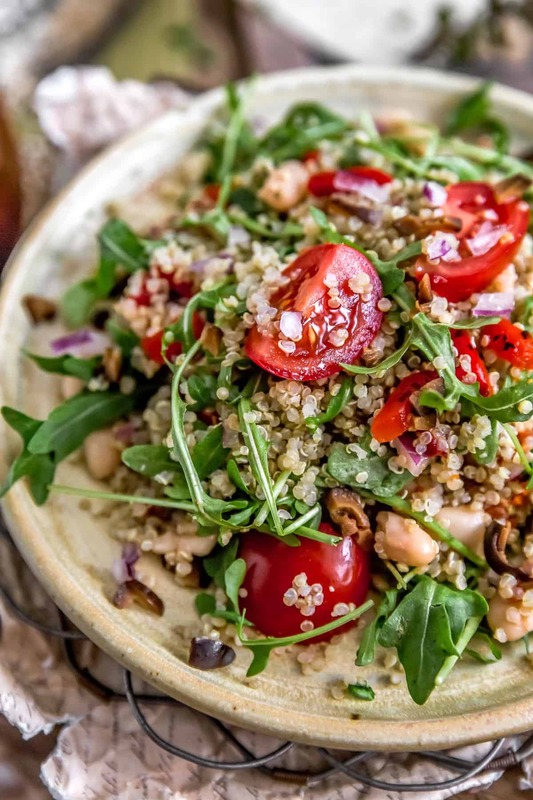 *Toasted Sesame Seeds: If you can’t find toasted sesame seeds, simply make your own by adding some sesame seeds to a nonstick skillet and heating over medium heat until they start to turn golden brown, then remove. Watch them carefully as they burn easily. *Servings: Makes 2 to 3 servings. This looks so good! Can’t wait to try it! Just want to say how beautiful your styling is – everything always looks so amazing! Just made garlic sticky noodles. Unbelievable is all I can say!!!! We had these tonight for dinner and the dish was amazing. I doubled it, because my husband is a big eater, and I added thinly sliced snow peas in with the spinach and scallions. I couldn’t find the noodles I usually use, so I used red rice Pad Thai noodles and there’s almost none left. My dachshund had seconds, too! Thanks!!!!! I made this tonight. I hadn’t planned to, so I didn’t have the correct noodles, so I just used some einkorn wheat pasta I had on hand. Due to this, I didn’t make the slurry. I did everything else as written. Wow, it was good! I will be making this again for sure. I have already passed along this recipe to someone else who is just starting WFPB who I think will love it too.